ă He had already served with Y & L, before 17148 Guardsman, attached to 1 Bn 2 Coy Coldstream Guards. He served on garrison duty at Windsor Castle, Buckingham Palace, Tower of London and the Houses of Parliament, before going to France where he took part in several big engagements. When the Armistice was signed he was on leave, but was recalled to serve with the Army of Occupation in Germany until 1919. He was standard bearer for Hathersage Royal British Legion and was one of ten members selected to represent Derbyshire in Czechoslovakia in October 1938. In his younger days he played full back for Hathersage F C and sustained a broken leg in round two against Bishop Auckland in the 1914 Amateur Cup. At one time he spent 3 months in an army prison for striking a superior officer. A letter from Pte H Schofield was printed in High Peak News 9/12/1916 and tells of conditions at the front; (The H Schofield who wrote the letter from the front would have to be Harry as Herbert was wounded in France 19/7/1915, shipped home 2/8/1915, where he spent the duration of the war till his discharge 10/10/1917). b 1883 Hathersage. 1904 married Sarah Wilson (b1883 Sheffield) and who died 1939. 1911C, living at The Dale, Hathersage, a railway platelayer. In the 1919 voters register he is still at The Dale. 1945 he marries Gladys Andrew, widow of Oscar Andrew. 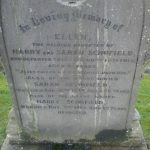 He dies 3/11/1965, and is buried in Hathersage Churchyard. Probate given to Alice Florence Andrew, his step daughter. He is 1st on right on the WHW2W p 54 photo. 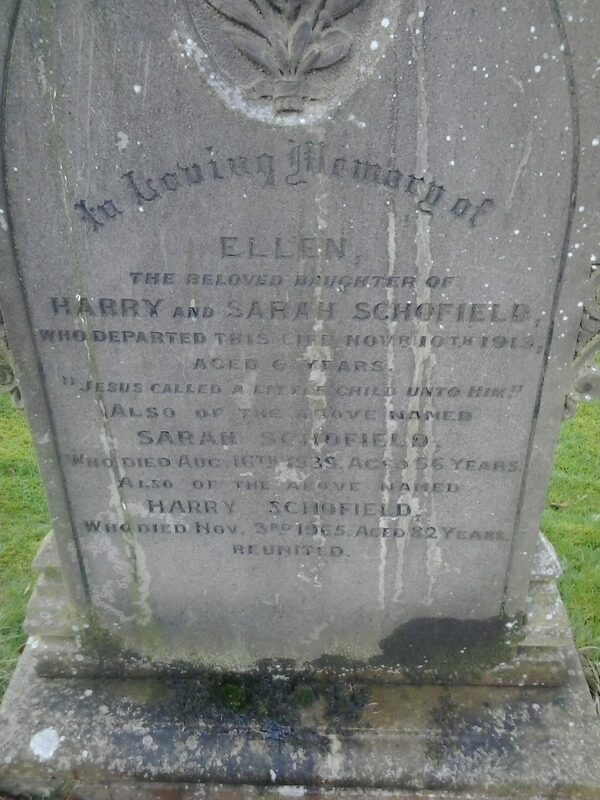 Father of Major Harry ‘Dobbin’ Schofield, who served in WW2, and who became headmaster of Hathersage C of E School.